The Boolchand's Story | Boolchand's | Explore. Seek. Find. It’s a story you couldn’t dream up, dotted with obstacles that would make most retailers turn back. Many of them did. But not Mr. Doulatram Boolchand Nandwani, known fondly to us as “Dada.” His amazing odyssey is 80-plus years in the making. It’s a journey where old-fashioned values like loyalty meet the latest offerings of authentic world-class brands. Where our close-knit family feeling extends to every employee. And where we’ve made the Caribbean our home while exploring exciting new destinations. For all its twists and turns, our journey has been and always will be guided by one simple goal: Our customers' happiness. Mr. Boolchand sets sail for Panama, where he begins working for an Indian business, Tarachand Bhojram, as a salesman. He is quickly promoted to the position of manager, and eventually becomes a working partner in the firm. Mr. Boolchand leaves Panama to return to India. The vision to open a business begins, originally with a business partner, Mr. Parsaram Narwani. The original Boolchand's store, at the time called Oriental Art Palace is opened in Curacao. Oriental Art Palaces originates as an importer of fine goods from China and India. The original store sold oriental gift items including Ivory carvings, carved wooden tables and screens, brassware, embroidered table cloths from India and China, pure silk cloth and Japanese embroidered Kimonos. Mr. Boolchand's son, Chuhermal Nandwani, falls ill of kidney trouble and must leave Curacao for Japan for treatment. He ultimately returns to India. 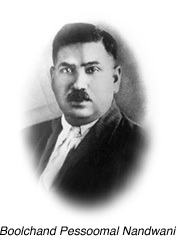 Doulatram Boolchand Nandwani ("Dada") joins the family business in Curacao, after the passing of his father earlier that year. The business was started by his father after a world-wide trip originating in Bombay on the Maluja Ship to France. Followed by another ship ride on the Queen Elizabeth from London to New York, through Kingston, Jamaica and finally to Curacao. The Boolchand Group opens a second store – Cortesia – in Curacao, this time in Hanchi Snoa. This same year, it also expands to Caracas, successfully opening a store under the Palacio Hindu brand name. In 1953, the original Caracas store is expanded into an adjacent space. The Boolchand Group establishes its first store in St. Maarten on Front Street, primarily selling linen tablecloths and blouses. The original glass storefront was imported from Puerto Rico as that size was not available in St. Maarten at that time. The Boolchand Group establishes operations in Bonaire and would have local operations until 2002. Riots engulf Curacao's Punda district, burning the entire building at Heerenstraat 10 (the original Oriental Art Palace) and all of the store's goods. With no insurance, Maduro & Curiel's Bank gives their full support so Dada can rebuild. The Boolchand Group relocates to the recently complete three-story building at Heerenstraat 4B and establishes new operations in the Curacao Freezone. Boolchand's establishes an exclusive distribution agreement with Marks & Spencer of London. Throughout the early 1970s, The Boolchand Group grows the portfolio of St. Michael Branded stores in Curacao, St. Maarten, St. Thomas and Aruba. Also in 1970, The Boolchand Group establishes operations in St. Thomas, selling tourist items and linens on the Waterfront, then relocating to 31 Main Street, where they begin to sell cameras and electronics as well. The Boolchand Group opens operations in Aruba, expanding to 6 stores over the course of 20 years. Boolchand's is offered the exclusive right to open franchise stores in the Caribbean under the Bye-Bye brand from Mexico. The Group quickly rolls out Bye-Bye stores in St. Thomas the same year, followed by St. Maarten, Aruba, Bonaire and finally Curacao. The Boolchand Group launches a new branded store focusing on fine jewelry and watches, D'Orlahn. D'Orlahn opens stores in Aruba. Stores in St. Maarten, Curacao, and St. Kitts followed the original store in Aruba. D'Orlahn was established to grow the branded boutique business with key luxury retailers. Ravee Nandwani, son of Ram and grandson of Dada, joins the family business in Curacao. The following year, Ravee is transferred to Aruba to run the local operations. This marks the official transition from a 3rd generation family business to a 4th generation family business. Working with the Minister and local government in St. Kitts, The Boolchand Group is one of the first island retailers to establish operations there, purchasing land and building five stores. The Boolchand Group is the first Indian-owned store to be opened in St. Kitts. The Boolchand Group begins its relationship with Pandora Jewelry, starting in St. Maarten and expanding to St. Thomas, Curacao and Aruba. The Boolchand Group deepens the collaboration with Pandora Jewelry, launching the first Pandora concept store in the Caribbean (the 30th Pandora retail concept store in the global network, which grew to over 700 by 2012). The Boolchand Group establishes plans to expand retail operations, as a Pandora partner, into new markets in the United States and South America. The Boolchand Group takes its 30-year relationship with Apple to a new level with the opening of a standalone Apple store in Curacao. This is the beginning of the franchise relationship as an Apple Specialist. The Boolchand Group launches two new Crocs concept stores in St. Maarten and Curacao. The Boolchand Group begins a Crocs franchise operation in the US Virgin Islands and open a New Havaianas Kiosk in the Paseo Herencia Mall, Aruba. The Boolchand Group opens a New Pandora Concept Store at The Mall of San Juan in Puerto Rico. Mr. Boolchand leaves Pakistan to Poona, only one month after India's independence day (August 15th). Dada buys an old building at Heerenstraat 4B, with the dream of eventually converting it into a three-floor retail store. This dream is finally realized in 1969, just in time to facilitate recovery from a major disaster that year. Dada helps the Ambassador of India in Brazil establish an Indian embassy in Caracas, Venezuela. The Boolchand Group opens a Duty Free store in Curacao airport's transit hall. The Boolchand Group expands its presence in Caracas with a second store location on Calle Real in Sabana Grande. Dada also establishes a successful wholesale business out of the Caracas location, selling to smaller shop owners in Isla Margarita and throughout Venezuela. Dada opens a second store in Curacao – La Fortuna - in Heerenstraat, moving from Hanchi Snoa. Government officials in St. Maarten invite 10 tourist trade companies of Curacao, including Boolchand's, to promote the island. The Boolchand group establishes a second store in St. Maarten, called the Taj Mahal, selling table cloths, jewelry, watches, liquor, tobacco, cigars and other tourist goods. Ram Nandwani, Dada's eldest son, arrives in Curacao from Tangiers to join the family business. The Boolchand Group purchases a lot with a small store in St. Maarten. In 1972, this house would be demolished and a brand new, 5,000 square foot store would be opened selling electronics, cameras, jewelry, watches and linen. The Boolchand Group's St. Thomas store is ruined by smoke from an adjacent fire. After reopening, another fire the following year causes a second "restart", followed by a theft within the store. The first several years in St. Thomas are challenging with several restarts. Haresh Nandwani, arrives from Poona to operate the Boolchand's stores in St. Maarten. Lachu Nandwani joins the family business to operate the Caracas business. In 1976, he would leave Caracas to join The Boolchand Group's St. Maarten operations. Dada becomes the first president of a newly registered organization, The Indian Merchants Association of the Netherlands Antilles (called I.M.A.N.A). Nari Nandwani, Dada's fourth son, arrives from India to St. Maarten, joining Haresh. The Boolchand Group expands the St. Thomas operations into the Havensight Harbour, simultaneously opening two locations there. Dada is appointed Honorary Consul of India for the Netherlands Antilles, covering Curacao, Aruba, Bonaire, St. Maarten, Statia and Saba. Lachu Nandwani leaves the St. Maarten operations to manage operations in St. Thomas, US Virgin Islands. Boolchand's is granted the exclusive right to distribute Ecco shoes from Denmark in the Caribbean. It also opens a standalone Ecco store in Curacao. Dada retires from the Honorary Consul role and Ram D. Boolchand is appointed to the post. The Boolchand Group exits retail operations in Venezuela, focusing on the core island retail and wholesale business. The Boolchand Group becomes a distribution partner of Havaianas of Brazil. The Boolchand Group becomes a distribution partner of Crocs shoes. Navin Nandwani, son of Nari and grandson of Dada, joins the family business in St. Maarten. Jai Nandwani, son of Lachu and grandson of Dada, joins the family business in Curacao. The Boolchand Group establishes a second Pandora Concept Store in St. Thomas and a third in Aruba. In 2011, a second Concept Store in St. Thomas is opened as well as a store in Curacao. The Boolchand Group expands operations, as a Pandora Partner, into the United States, opening up in Miami. The Boolchand Group now operates 6 shop-in-shops and 6 concept Pandora Jewelry stores.